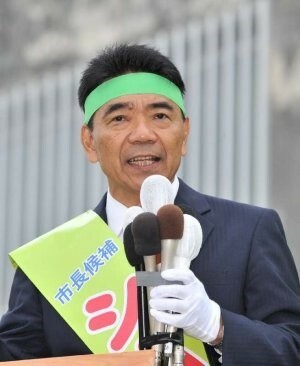 It was the November 2014 victory (by 100,000 votes) of Onaga Takeshi in election for Governor of Okinawa on an explicit « everything in my power to prevent construction of the Henoko base » platform that brought the crisis to its present pitch. Once in office, Onaga appointed a « Third Party » (experts) committee to advise him on the legality of his predecessor’s sudden and unexpected decision (in December 2013) to allow the base. That Committee reported in July 2015 that it had found multiple legal flaws,2 and that, in particular, the landfill permit failed to meet the criteria for « appropriate and rational use of the national land » and so violated the Public Waters Reclamation. On October 13, 2015, Onaga therefore cancelled the reclamation license, and by doing so precipitated a series of court actions and a political contest that has continued ever since. In the year ahead, three important elections are to be held: in January for mayor of Ginowan City, in June for the Okinawan Prefectural Assembly, and in July for the upper house (House of Councillors) in the national diet. About one quarter of the area of Ginowan City is taken up by the US Marine Corps’ Futenma Air Station. US forces occupied the site around 70 years ago, when the residents of the area had been rounded up into detention centres even before the formal Japanese surrender at the end of the war, and have continued to occupy it, in breach of international law even if with the consent, or encouragement, of the government of Japan, ever since then. When the city goes to the polls on January 24 to choose a new mayor, the question of what is to be done about Futenma is a major issue, but the will of the people matters less than the will of the two faraway governments, in Tokyo and in Washington. Nothing has changed in that respect over the four decades since Okinawa nominally reverted to Japanese rule, nor can it be expected to change in 2016. The balance is said to be delicately poised between Sakima Atsushi, the incumbent mayor who is supported by the LDP and New Komeito (and by the Abe government) and Shimura Keiichiro, a relatively unknown former prefectural official who has declared himself one of the Onaga « All Okinawa » camp. Sakima was first elected mayor in 2012, by the narrow margin of 900 out of 45,000 votes. 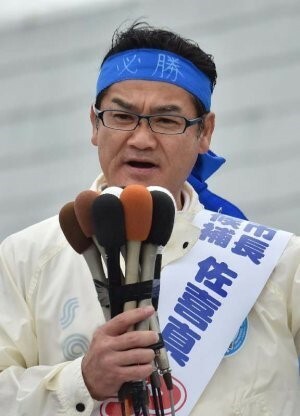 Facing then a well-known opponent of any base substitution within Okinawa, Iha Yoichi, (Ginowan mayor for two terms, 2003-2010), Sakima too adopted a « no Futenma substitute within Okinawa » stance. That is to say, he refsed to endorse the Henoko project as a quid pro quo for closure of Futenma. However, in 2013, he was part of the collective Okinawan « tenko » or conversion under pressure, abandoning his campaign political pledge and shifting to support the Abe government’s position, i.e. favouring construction of a major new « Futenma Replacement » US facility at Henoko. Governor Nakaima, elected in 2010 on an « anti-substitute base » platform, also surrendered, dramatically, to such pressure late in 2013, as did the LDP prefectural party organization itself, and much of its membership. Okinawan conservative ranks thus split. 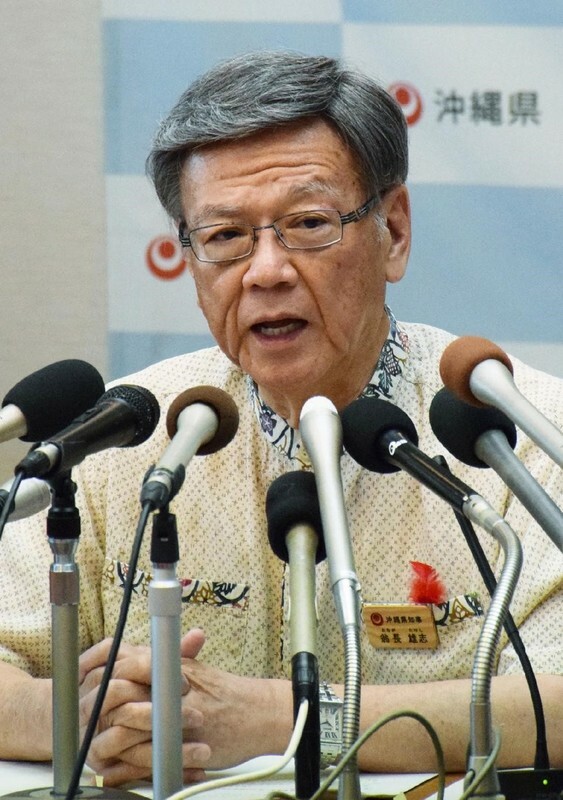 Those that resisted the fierce pressure from the Abe government in Tokyo to fall into line with national policy evolved the « All Okinawa » political platform, of which Onaga Takeshi, Governor from December 2014, became the principal avatar. Both the Abe government and Governor Onaga insist that this election will not be decided solely on the base issue, but both attach great importance to it. The Abe government even ordered an almost four-week suspension of works at the Henoko site,3 evidently anxious to avoid attention focussing on the base issue out of fear that its preferred candidate might lose if his past reversal or his pro-base position became focus of the election. For Onaga the election is also obviously important. A victory in Ginowan would show the strength of continuing support for his « All Okinawa » cause (currently he has the backing of only two of the prefecture’s 14 town and city mayors) and perhaps create a momentum that might flow on to the nationally important Upper House elections to be held in the coming summer. Prefectural Assembly elections are to be held in June 2016. For the political and judicial battle that lies ahead, the importance of Onaga’s retention of control over the Okinawan parliament, the Prefectural Assembly (where he now holds 27:21 majority support), is plain. Abe would dearly like to reverse that balance. Then in July there will be (national) Upper House elections, at which the Abe government’s Minister for Okinawa, Shimajiri Aiko, will be standing for re-election. She is a darling of the Abe government because of the role she played in 2013 in helping the national LDP win back control over the rebellious Okinawa branch. For her role in leading Okinawan LDP Diet members (and other figures such as Ginowan mayor Sakima) to abandon their public pledges of opposition to base construction, she won his deep gratitude and, as a devoted Abe follower and fierce critic of the Okinawan anti-base movement, rose meteorically within the government thereafter. Her status in the national government give her formidable patronage powers in relation to Okinawa that she will undoubtedly use to advance the Henoko cause, but her checkered political career has also won her many enemies. In judicial terms, Chief Cabinet Secretary Suga Yoshihide made clear even before Onaga’s October 2015 cancelation order that site works would proceed irrespective of any order from the Governor. Contracts were let, materials moved, workers hired, a momentum generated. Then came Onaga’s order, followed the next day by the complaint lodged by Okinawa Defense Bureau (OBD) with the Ministry of Land, Infrastructure, Transport and Tourism (MLITT), asking it to review, suspend, and nullify Onaga’s revocation under the Administrative Appeal Act.8 It amounted to one section of the Abe government (the ODB, part of the Ministry of Defense) appealing to another (MLITT), so the outcome could scarcely be in doubt. ODB maintained that there were no flaws with the land reclamation approval made in late 2013 and that Governor Onaga’s revocation disposition was illegal. Onaga presented a 950-page dossier in which he outlined the prefectural case, 9 but, following a cabinet meeting on October 27, MLITT minster Ishii Keiichi suspended the Onaga revocation order,10 on grounds that otherwise it would be « impossible to continue the relocation » and because in that event « the US-Japan alliance would be adversely affected. » 11 The government also authorized a resumption of site works, insisting there was no alternative to the Henoko project and that it amounted to a « burden reduction » for Okinawa even though plainly the new base was to be bigger, more multi-functional, more modern, and almost certainly permanent. On October 20, 2015, a group of 12 Ginowan citizens (increased by late December to 89) launched a suit demanding cancelation of Governor Onaga’s order, complaining that the Third Party report the Governor had relied on was « biased » and « flawed » and that Onaga’s cancelation order, if implemented, would have the effect of leaving Ginowan citizens facing more-or-less permanent noise and other nuisance from Futenma.12 This pro-government, pro-Henoko construction judicial intervention was only the first of a series that continued through the following months. When works resumed on October 29, 2015, they government referred to them as « main works » (hontai koji), evidently in order to have them seen as a fait accompli and even though the necessary boring survey was still incomplete. On November 17 the government launched a suit in the Naha branch of the Fukuoka High Court under the Administrative Appeals Law demanding the Governor retract his order and submit to its authority. Abe repeatedly spoke of Futenma return, but only on condition that there be an alternative, and with the understanding that such an alternative had to be in Okinawa, and in Okinawa it had to be at Henoko. On November 2, 2015, he launched a prefectural complaint against the Abe government with the rarely consulted Council for Resolving Disputes between Central and Local Governments. »14 Despite the fact that it would be hard to imagine anything that could better qualify as dispute between those two wings of government, it took barely six weeks for the Council to decide, without calling upon any evidence (and declaring its « verdict » by means of a press conference) that the complaint was « beyond the scope of matters it could investigate. »15 Okinawa prefecture soon made clear that it intended to contest this decision by appeal to the Naha District Court. On December 25, Onaga launched a prefectural suit in the Naha court to have the October ruling by the Minister set aside. 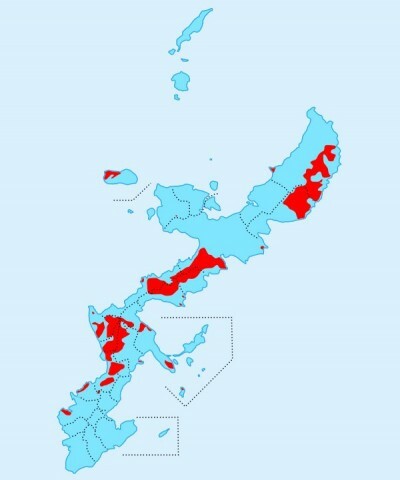 State and prefectural authorities thus sued each other (or made formal complaint in the case of the Disputes Resolution Council) over the same matters, and for the most part in the same Naha court.16 Never before had the national government of Japan faced off in the courts against any self-governing region like this. While the prefecture insists it is a breach of its constitutional entitlement to self-government for the state to impose the Henoko construction project on it by unilateral, forceful decision, the state, for its part, argues that base matters are its prerogative, having nothing to do with local self-government, and being a matter of treaty obligations are not subject to any constitutional barrier. Onaga also pointed to what he saw, on expert advice, as fatal flaws in the land reclamation approval process. He objected to the ODB’s use of the Administrative Appeal Act, for which purpose the state was pretending to be just like a « private person » (ichishijin) complaining under a law specifically designed to allow individual citizens complaining of unjustified or illegal acts by governmental agencies to seek redress, and noted that, while the state sought relief as an aggrieved citizen it deployed its full powers and prerogatives as state under the Local Self-Government Law to sweep aside prefectural self-government and to assume the right to proxy execution of an administrative act (gyosei daishikko). The state was in his view thus adopting a perverse and arbitrary reading of the law. Onaga Takeshi thus ended his first year in office as Governor embroiled in two suits against the government of Japan, one as plaintiff and one as defendant, and committed to enter (before the end of January 2016) upon a third quasi-judicial proceeding by way of appeal against the decision of the Disputes Resolution Council. Judicial precedents are not encouraging for Okinawa. In December 1959, the Supreme Court held in the « Sunagawa case » that matters pertaining to the security treaty with the US are « highly political » and concern Japan’s very existence, so that the judiciary should not pass judgement on them. That ruling, on expansion of the existing US base at Tachikawa, in effect elevated the Security Treaty above the constitution and immunized it from any challenge at law, thus entrenching the US base presence. It would be surprising if the 2016 court, addressing the project to create a new base at Henoko, did not follow it. Another precedent addresses more directly the Okinawa base issue. It is just 20 years since then Okinawan Governor Ota Masahide (Governor 1990-1998) was arraigned before the Supreme Court facing the demand by the Prime Minister that he exercise his duties of state under the Local Self-Government Law to sign the proxy lease agreements on privately owned land appropriated by the US military (which he had refused to do). Ota made an eloquent plea, but the court dismissed it, contemptuously, in a two-sentence judgement.21 For Ota, the Supreme Court ruling was the last word. He submitted and signed the proxy lease agreements. As for how Governor Onaga would react if all Okinawan claims were simply dismissed, the Ota precedent is sobering and Onaga’s lifelong membership of the LDP makes one incline to think he would be even less inclined to resist a Supreme Court order than Ota. Yet prediction is not straightforward. Though unashamedly conservative, Onaga prioritizes his identity as Okinawan over ideology and « all Okinawa » is his core slogan. It may be only a straw in the wind but, in November 2015, Onaga’s wife, Mikiko, promised the protesters assembled at the Camp Schwab gate that if all other steps had been taken (bansaku tsukitara) and still the project had not been stopped, she and her husband would come to join them in direct action (Ryukyu shimpo, November 8, 2015). They would stop the construction at all costs, even, in other words, by civil disobedience. This, needless to say, highlights the unique and uniquely problematic nature of Okinawa within the Japanese state and the depth of the contradiction on which the relationship is built. Should the decision, or series of decisions, go against Okinawa, and should the Governor (and his wife) then join the direct action resistance at Henoko, the government could, if it so chose, then sweep them away from the gate of Camp Schwab, beating, arresting, and if necessary indicting them, and press ahead with construction. This is essentially what government has been doing for well over a year, though as yet on a small scale. It does so with impunity because its actions escape national media scrutiny and (on the whole) international attention. But if would be a different matter to subject the highly popular Governor in person to such measures, especially because it would mean ordering the prefectural police, who nominally are under the Governor’s command, to arrest him. Such evidence of open clash between wings of the government of Japan would weaken the US military ties that Abe is intent on strengthening, upset the Pentagon, and expose Japan to the world as an anti-democratic state that deployed violence against its own citizens. Apart from the political and judicial contest, however, it may be that the really crucial area of confrontation is that between the forces of the Abe state and the people of Okinawa gathering every day at the gate of the Camp Schwab site to try to block construction works by direct, non-violent action. The daily gathering that Onaga Mikiko addressed in November 2015 has continued now for well over 500 days, since July 2014. The violence of riot police on land and Coastguard at sea takes its toll of the protesters, who number on a day-to-day basis between 50 and 500 or so, but their morale remains high. They believe they are currently forcing a stoppage of works on roughly one day a week, and plan to step that up to two, three, etc. As I have noted elsewhere, the crisis today pits the « irresistible force » of the nation state against the « immovable object » of the Okinawan resistance and, in that sense, it has a certain tragic quality. Prime Minister Abe has staked so much on completing and handing over the new facility to the US Marine Corps that it is almost unimaginable that he could ever abandon it. Governor Onaga is in a similar, if opposite, position. Even if he were to submit to a court ruling, and withdraw his opposition (which, for reasons already given above, seems unlikely), far from resolving matters that would further infuriate the Okinawan people and heighten their resentment of their own government and of the base system. The supposed linchpin of the regional security system would then become its Achilles heel. As writs were issued and injunctions sought late in 2015 and early 2016 to prevent (or to impose) base construction, Abe’s government appeared to be striving to evade any possible adverse judicial ruling by pushing the works with all possible speed beyond a point of no return. 25 The government that did not hesitate in July 2014 to change its interpretation of the constitution to suit its political agenda was in 2016 manipulating the law and intervening in unprecedented ways to try to determine the outcome of a city mayoral election, to impose its will on a recalcitrant prefecture. For the Okinawan resistance to prevail against such a desperate and unprincipled state, it will have to widen the current struggle and gain the support not just of « All-Okinawa » but of an « All-Japan » citizen alliance and an accompanying global movement. Gavan McCormack is an honorary professor of Australian National University, editor of the Asia-Pacific Journal, and author of many texts on aspects of modern and contemporary East Asian History, including Resistant Islands: Okinawa Confronts Japan and the United States, Boulder: Rowman and Littlefield, 2012 (co-authored with Satoko Oka Norimatsu). His work is widely published in Japanese, Korean and Chinese, as well as English. For some of his recent essays (other than those accessible at this site), see « Okinawa as sacrificial victim, » Le Monde Diplomatique, October 2015, pp. 6-7, and « Chauvinist nationalism in Japan’s schizophrenic state, » in Leo Panitch and Greg Albo, eds, The Politics of the Right, Socialist Register 2016, London, The Merlin Press, 2015, pp. 231-249.